The Cabinet is split over when Enda Kenny should step down as Taoiseach, with one of his closest allies urging him to remain in place until June. Several ministers say they are losing patience with Mr Kenny, particularly after he cited Brexit and the political crisis in the North as reasons to delay his departure. Critics of the Taoiseach now say his handling of the leadership issue is confusing voters and playing in to the hands of Fianna Fáil and Sinn Féin. One Cabinet source last night went as far as to accuse Mr Kenny of putting his own ego ahead of the party's interests. 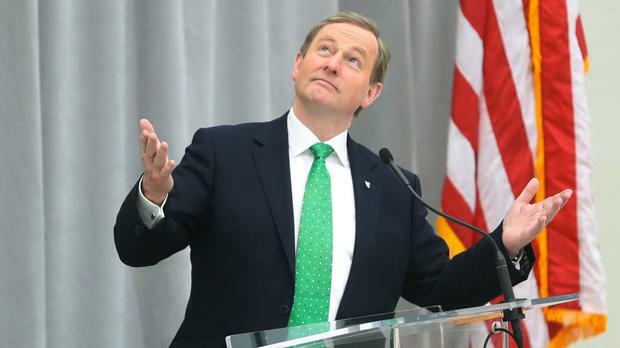 "It's all about Enda," the source said. Another minister said the constant ream of coverage in relation to the issue was creating problems. "For that, Enda only has himself to blame," the minister said. Mr Kenny surprised colleagues last week after insisting during his visit to the US that issues such as the political stalemate at Stormont takes precedence over the leadership. Rebel TDs within the party have decided against raising the issue at tomorrow's parliamentary party meeting. But in yet another intervention aimed at prolonging Mr Kenny's tenure, Finance Minister Michael Noonan said he should remain in place until the end of May/early June, when the second phase of Brexit negotiations are scheduled. "Certainly for the primary principles of the negotiations, which won't conclude until end of April/early May, the Taoiseach should be in position," Mr Noonan told RTÉ's 'Six One' News. "But it's my opinion that he should stay on until the second phase as well, when the details of Ireland's negotiation position have been established and have been signed off on, and that's the end of May/early June." Fianna Fáil leader Micheál Martin yesterday said ministers were fixated on the leadership issue and "jousting for profile" so they would appear in the following day's newspapers. "My own genuine sense since the Government was formed is there's been too much internal angst within the Fine Gael party, that they've been very unsettled," Mr Martin told East Coast FM's 'The Morning Show'. Speaking in Cork yesterday, Housing Minister Simon Coveney said he did not foresee a vote of no confidence in the future because it would not, in his view, get enough support. He urged party members to be patient, but refused to speculate on when Mr Kenny would signal the end of his 15 years at the helm of Fine Gael. "I think they will wait for him to put in place a process, like he said he would, so we can manage this in a way that is good for the Government in terms of stability through an important period and also good for the party," he said.